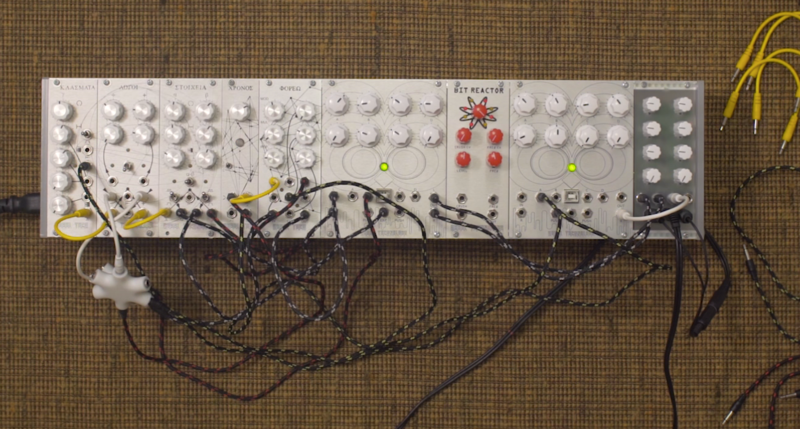 In this tutorial we’ll be looking at how to do some algorithmic beat sequencing on a modular synthesiser with some Rebel Technology modules. Remember, you can click on the photos to enlarge them and see the connections better. We begin with our tap tempo clock, Chronos. 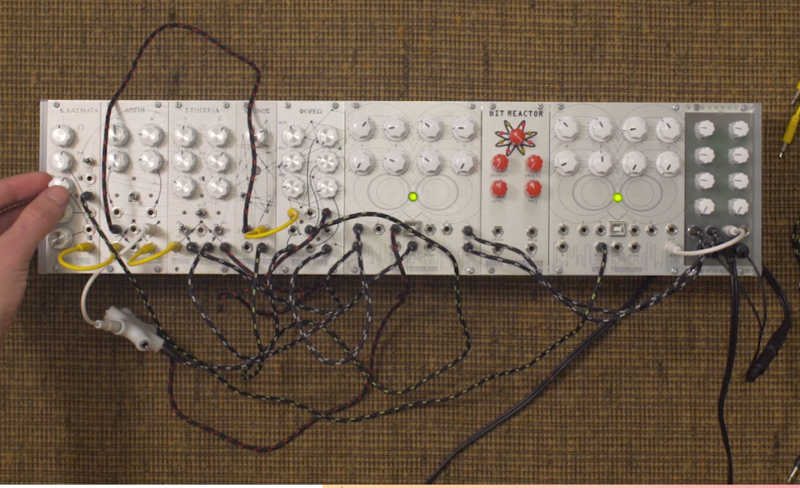 We connect Chronos into Stoicheia, a dual euclidean gate sequencer. Stoicheia gives us two channels of trigger processing. To generate some sounds, we can put both of these into the first OWL Modular which is running the Dual Drum patch. 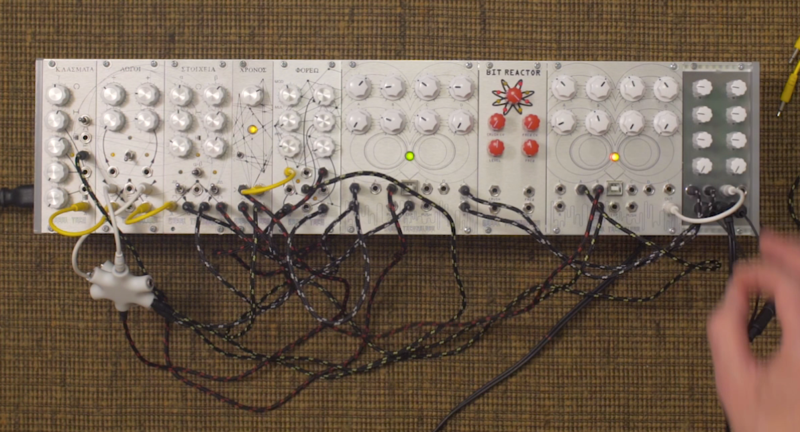 In this patch, the two drum sounds are triggered by the left and right audio inputs. The left input trigger triggers the hats, which we can hear when the left audio output is connected to the mixer. The right audio input triggers the kick drum, which we can connect the second channel of Stoicheia to. Stoicheia generates two sequences. We can control the length of the sequence – the 16 steps – and the amount of beats within it. At half, it’s on every other beat, roughly. At 100% every clock triggers a beat. When you have odd numbers, they get filled in algorithmically by the Euclidean algorithm which has some very musical results – it’s difficult to go wrong with it! We can take the clock from Stoicheia into Logoi, a voltage controlled clock divider. We can use the counter function of Logoi to add some air under the hi hats, by modulating the decay time of the hats (input B on the OWL) using a trigger. We can also multiply the trigger with a simple multiplying device, and connect the same signal to the emphasis input (input EXP) which gives emphasis on certain hits of the kick and hats. If you have two sequences of different length on Stoicheia, they don’t cycle at the same length, so you can get interesting polyrhythmic effects, and a pattern that doesn’t repeat every 16 steps. 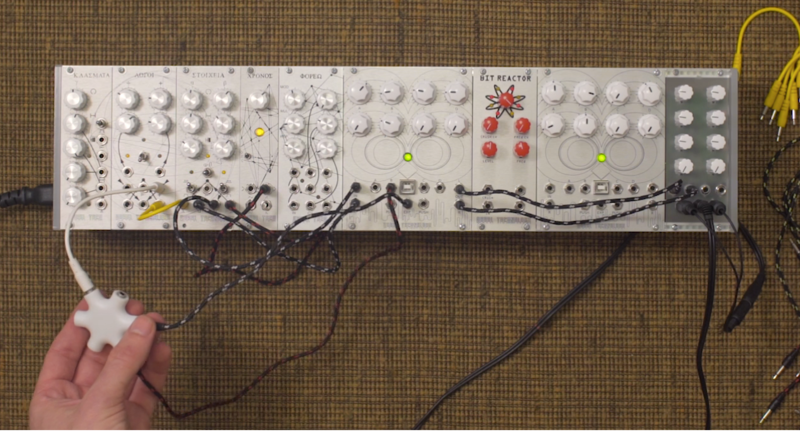 To add some movement to the pattern, we introduce Phoreo, a triple trigger processor for modulation, rolls and repeats. We send the clock through Phoreo. The trigger from the hats can go into the repeater input of Phoreo and out again. Now, instead of just getting single hits on the hat, we get can double or triple hits, and multiply the rate. Each function of Phoreo has a CV input, and we have an LFO in Chronos. If we take the divider output from Logoi into Chronos it synchronises the LFO, giving us a nice slow LFO. If we want to hear what that LFO sounds like, we can take the output of this ramp from Chronos into the pitch of the kick (input C on the OWL), and we can hear the pitch of the kick it rising over time, with the rate determined by the divider of Logoi. Let’s now disconnect the LFO from the pitch of the kick, and use it instead to modulate the multiplier on Phoreo, and add some repetitions to the hats. To this basic beat we could now add a synth sound. On the second OWL we’ve loaded an oscillator we can use for this. We still take the clock from Chronos, though it’s going through Phoreo, through to Stoicheia, and through to Klasmata. 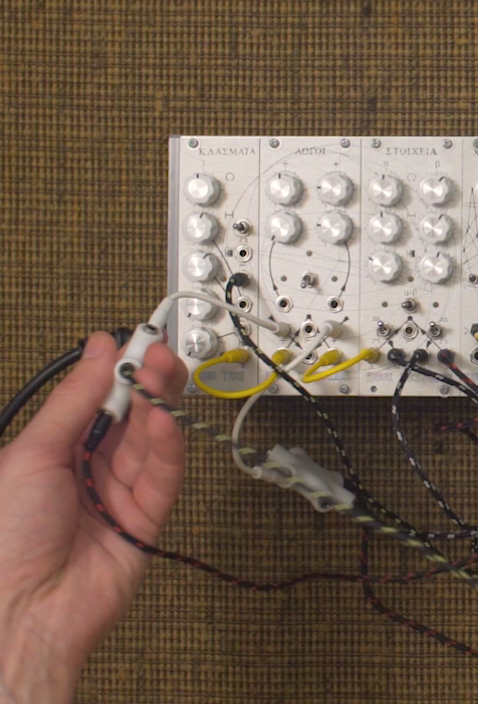 Klasmata has the same function as one channel of Stoicheia but with added CV inputs. 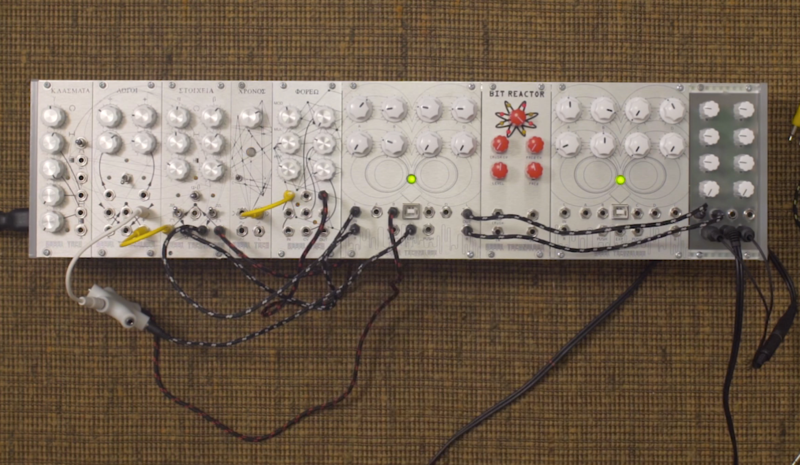 We take the trigger output to the push input on the second OWL to trigger synth envelopes to get a bass line going. Next, we use a multi on the clock divider output which we’re using to synchronise the LFO. 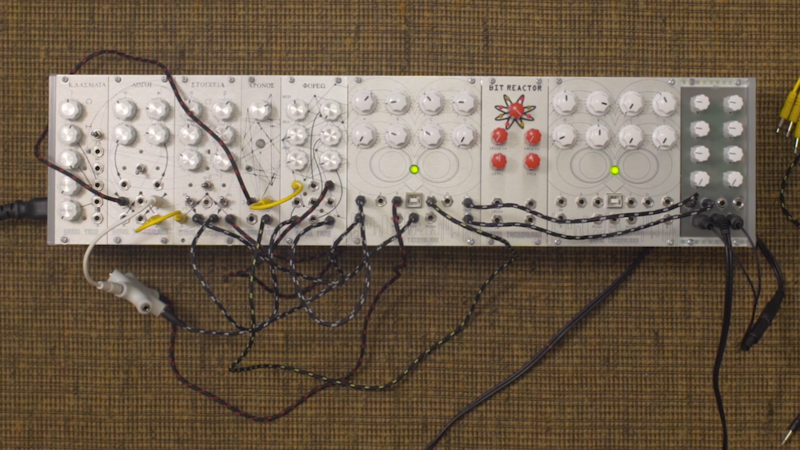 We connect the divider output into the pitch modulation of the synth patch. This gives us a bit of a bass line. Now, as we all know, everyone loves turning the cut off frequency of a low pass filter up and down. 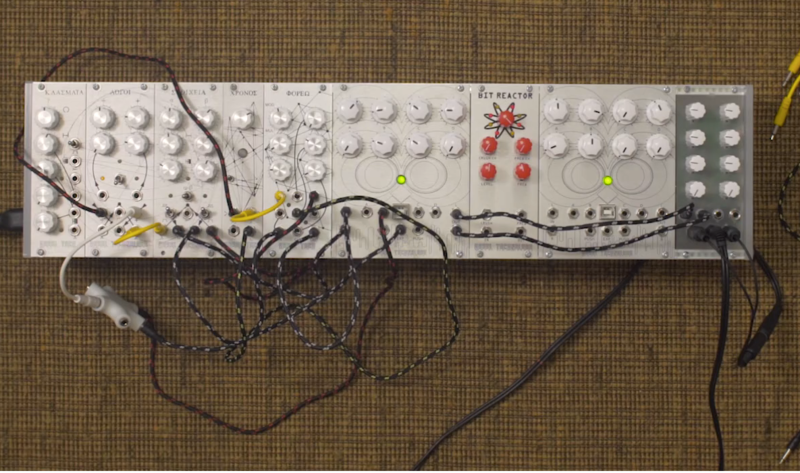 We could use an LFO to do this for us, taking an LFO out from Chronos to the cut off input on the second OWL. Now, get patching and send us your algorithmic dance anthems!